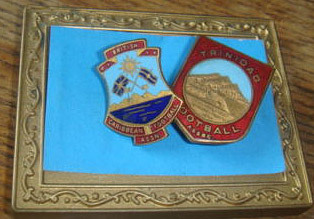 These scarce, button hole type badges, which are in good condition, were given to the tour party by the BRITISH CARIBBEAN FOOTBALL ASSOCIATION and the TRINIDAD FOOTBALL ASSOCIATION. They were part of the private collection sold @ auction, of a long serving English F.A. official.